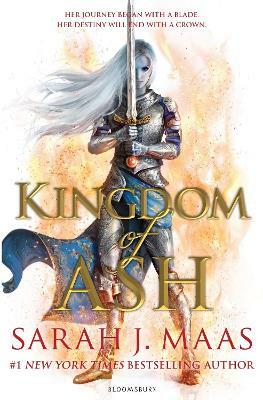 THIS IS A SPOILER-FREE REVIEW OF KINGDOM OF ASH MY THOUGHTS: 1. I TRIED not comparing Kingdom of Ash to A Court of Wings and Ruin, but IT JUST KEPT HAPPENING INSIDE MY HEAD. I have to say, in terms of the PLOT, this book took the cake. There was something of substance happening any every point, even though the first 200 or so pages could have been cut out and/ or condensed. There were multiple wars, happening across the continent, with different characters and it was INTERESTING, to say the least. 2. ACOWAR, EVEN DURING THE WAR, WAS A LOVE STORY BETWEEN TWO PEOPLE, BUT KINGDOM OF ASH WAS THE LOVE STORY BETWEEN THE CHARACTERS AND THEIR DREAM OF A BETTER WORLD, AND IT WAS JUST A BETTER BOOK TO READ. 3. Sarah J Maas’ writing, though, pretty much remained the same. There was a repetition of the same thing with different synonyms when she described an emotion or emotional experience. There were a lot of places where there periods were used that SHOULD HAVE BEEN commas, semi-colons or even hyphens being used and that’s to my UNTRAINED EYE. 4. So, basically while the writing was mediocre, the PLOT INTRIGUED ME. Add that together with the fact that I’d been WAITING TO FINISH THIS SERIES, I managed to finish this 988-page monster in three days, and even shed a tear or two at a particular Yrene Towers scene and the king of magic she thought during that time. 5. I WOULD ALSO LIKE TO START A PETITION STATING THAT AEDION ASHRYVER WAS THE REAL HERO OF THIS SERIES AND THAT HE DESERVED SO MUCH MORE THANKS. Would I recommend this series? Yes! It has a lot of flaws, and it’s definitely not for younger teens, but the plot, twists and character development are absolutely phenomenal! 4 stars.